Use these Valentine cookie recipes to celebrate the occasion with delicious homemade cookies that you'll enjoy serving to your family and friends. Everyone loves the old fashioned homemade taste, especially the delicious chocolate and natural lemon flavors. For Valentine's Day, simply cut the rolled out dough using your favorite heart-shaped cookie cutters and decorate with your choice of white, red, or pink frosting. These cookies are also great for serving at anniversaries, birthdays, and for gift giving. 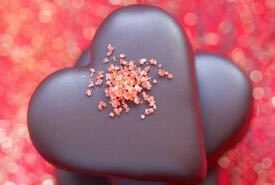 For this Valentine cookie recipe, beat to a cream half a cupful of butter and one tablespoonful of lard. Gradually beat into this one cupful of sugar; then add one-fourth of a teaspoonful of salt, one teaspoonful of cinnamon, and two ounces of Walter Baker & Co.'s Premium No. 1 Chocolate, melted. Now add one well-beaten egg, and half a teaspoonful of soda dissolved in two tablespoonfuls of milk. Stir in about two cupfuls and a half of flour. Roll thin, and, cutting in either round or heart shapes, bake in a rather quick oven. The secret of making good cookies is the use of as little flour as will suffice. Stiffen the dough with about 3-1/2 cups flour and use about 1 extra cup of flour to dredge the bake-board when rolling out dough and for sifting over the greased baking sheets so the cookies will come off readily. Roll dough very thin and cut in any desired shape. From this recipe may be made 100 small cookies. The baking sheet (17 x 16 inches) holds 20 of these small round cookies. Do all young housewives know that if dough for small cookies be mixed the day before baking and stood in a cool place, the cookies can be cut out more easily and the dough may be rolled thinner, and as less flour may then be used, the cookies will be richer? Aunt Sarah always cut these cakes with a small round or heart-shaped cookie cutter and when all were on the baking sheet she either placed a half of an English walnut meat in the center of each cake or cut out the center of each small cake with the top of a pepper box lid before baking them. Your guests will love the delicious almond hearts and daintily shaped treats made of puff pastry described below. These Valentine cookie recipes make old fashioned treats that are delicious, affordable, and easy and fun to prepare. They're so good tasting, you'll enjoy eating them any time. Be sure to visit my easy pie crust recipes page for complete instructions on how to make Grandma's delicious, homemade puff-paste that tastes better than anything store-bought. The title of this old fashioned Valentine cookie recipe, puits d'amour, translates into English as "wells of love," making this the perfect dessert treat for Valentine's Day! Ingredients: Puff-paste (1/2 lb of paste is sufficient for 2 dishes of pastry), the white of an egg, sifted loaf sugar. Method: Make some good puff-paste by recipe; roll it out to the thickness of about 1/4 inch, and, with a round fluted paste-cutter, stamp out as many pieces as may be required; then work the paste up again, and roll it out to the same thickness, and with a smaller cutter, stamp out sufficient pieces to correspond with the larger ones. Again stamp out the center of these smaller rings; brush over the others with the white of an egg, place a small ring on the top of every large circular piece of paste, egg over the tops, and bake from 15 to 20 minutes. Sift over sugar, put them back in the oven to color them; then fill the rings with preserve of any bright color. Dish them high on a napkin, and serve. So many pretty dishes of pastry may be made by stamping puff-paste out with fancy cutters, and filling the pieces, when baked, with jelly or preserve, that our space will not allow us to give a separate recipe for each of them; but, as they are all made from one paste, and only the shape and garnishing varied, perhaps it's unnecessary, and by exercising a little ingenuity, variety may always be obtained. 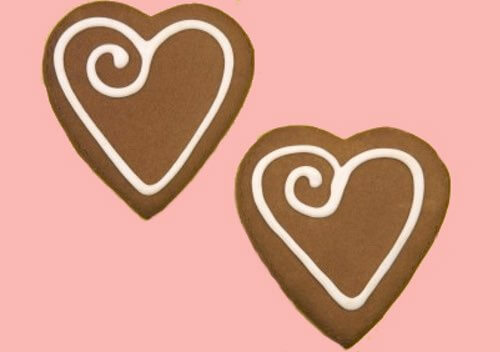 Hearts, half-moons, leaves, diamonds, stars, shamrocks, rings, and so on are the most appropriate shapes for fancy pastry, seasonable at any time. Ingredients: Puff-paste; to every 1/2 lb of paste allow 3 oz of almonds, sifted sugar, the white of an egg. 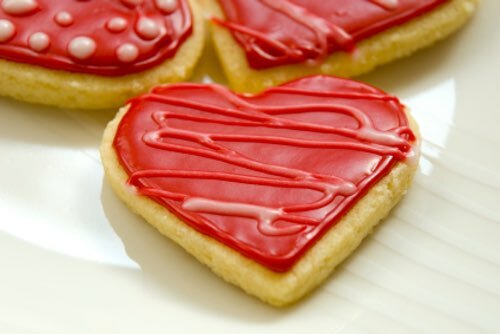 Method: For this Valentine cookie recipe, roll the paste out to the thickness of 1/4 inch, and, with a round fluted cutter, stamp out as many pieces as may be required. Work the paste up again, roll it out, and, with a smaller cutter, stamp out some pieces the size of a shilling. Brush the larger pieces over with the white of an egg, and place one of the smaller pieces on each. Blanch and cut the almonds into strips lengthways; press them slanting into the paste closely round the rings; and when they are all completed, sift over some pounded sugar, and bake for about 1/4 hour or 20 minutes. Garnish between the almonds with strips of apple jelly, and place in the center of the ring a small quantity of strawberry jam; pile them high on the dish, and serve. This tasty Valentine cookie recipe can be used to make fancy pastry strips or bars for any special occasion. Ingredients: Puff-paste (1/2 lb of paste will make 2 dishes of sandwiches), jam of any kind, the white of an egg, sifted sugar. Method: Roll the paste out thin; put half of it on a baking sheet or tin, and spread equally over it apricot, greengage, or any preserve that may be preferred. Lay over this preserve another thin paste; press the edges together all round; and mark the paste in lines with a knife on the surface, to show where to cut it when baked. Bake from 20 minutes to 1/2 hour; and, a short time before being done, take the pastry out of the oven, brush it over with the white of an egg, sift over pounded sugar, and put it back in the oven to color. When cold, cut it into strips; pile these on a dish in a pyramidal manner, and serve. These strips, cut about 2 inches long, piled in circular rows, and a plateful of flavored whipped cream poured in the middle, make a very pretty dish. Seasonable at any time. 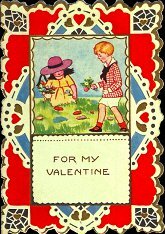 The vintage valentine card above is one Mom received at a class Valentine's Day party in 1920. 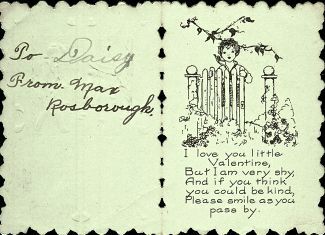 Receiving a store-bought card was really something in those days, as money was scarce and most kids had to be content with making their own. Most people baked their own cookies back then too, likely using these old fashioned Valentine cookie recipes. You can use them to make special cookies for any holiday celebration. Simply cut them in shapes other than hearts.